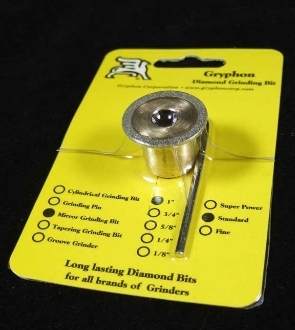 Use jewelry bits to grind a groove into the edges of jewelry for finishing and wire wrapping. A huge time saver! Best of all, your jewelry pieces will be more durable. Bits fit most glass grinders. Available in Fine Grit 220 only. 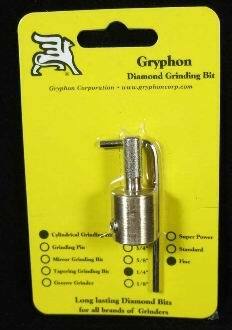 1" Gryphon Grinder Bit Description Made with a patented diamond bonding process for extra long life. This bit can be used for drilling holes as well as for general grinding. In general grinding where a very tight curve is required, a grinding pin is often the only choice. Because the Grinding pins have diamond on the top face as well as the sides, they can be used to drill holes in glass. Once a hole is drilled, they can also provide fine grinding and elaborate shapes within the inner surface. Virtually unlimited shapes are possible by this technique. 3/4" bit fits most grinders.